There's no shortage of India volunteer opportunities, but many involve agencies that require volunteers to pay high fees (thousands of dollars) for the experience. The fees cover administration, accommodation, and food but it can work out a lot cheaper if you deal directly with the volunteer organizations themselves. Some organizations and hosts even provide board, so it works out very inexpensive indeed. The following opportunities are either free, or there's minimal cost involved. And, there's a wide range of opportunities to suit everyone! WWOOFing (Willing Workers on Organic Farms), is a worldwide concept that's been steadily gaining popularity in India. The number of hosts has grown from just a few in 2000, to over 100. They include tea estates, coffee estates, and vegan agricultural communities. It's a great way to learn as well as experience life in the Indian countryside. Food and accommodations are provided. To join, there's a membership fee of $40 for singles or $60 for couples, for 12 months. Worldpackers.com is a popular worldwide community platform that connects verified hosts with travelers who are looking to exchange their skills in return for somewhere to stay. There are plentiful opportunities in India, many of which are at new backpacker hostels across the country. The work includes social media, photography, arts and music, web development, administration and reception. Other opportunities include social work, child care, teaching, and farming. An annual membership fee of $49 is applicable. HelpX is short for Help Exchange. It's an online bulletin board where hosts all around the world put up notices for help required. 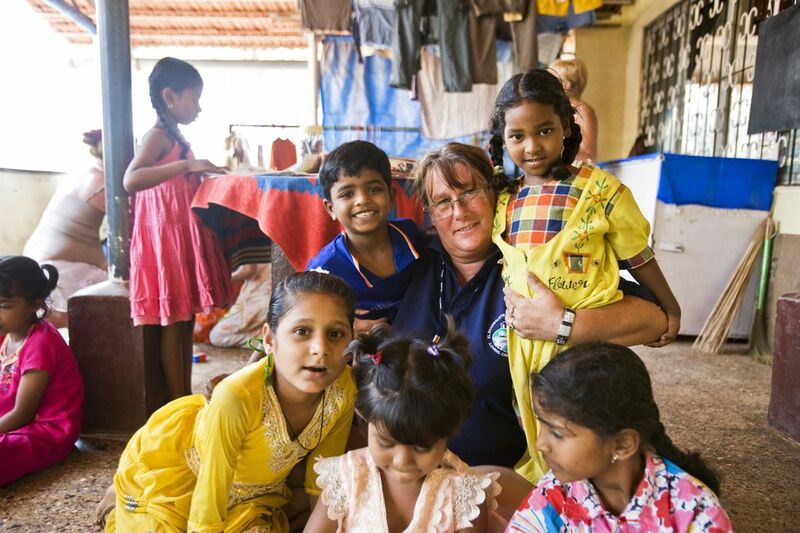 The great thing about HelpX is the diversity of India volunteer opportunities on offer. You can do everything from helping run guest houses to teaching English, and working on farms. Accommodations, and at least one meal (often all), are provided to volunteers free of cost. You'll need to sign up to the website, and pay a membership fee, to be able to contact the listed hosts though. If you'd like to combine volunteering with travel to a remote high-altitude alpine region, Spiti in Himachal Pradesh, Ecosphere Spiti offers opportunities to help local communities there. You can participate in construction of much-needed facilities, such as greenhouses for growing vegetables and structures for passive solar heating. If construction isn't your thing, another option is to assist the villagers with their daily activities. Located in Kanda, a village near Bageshwar in Uttarakhand, the grassroots Rural Organization for Social Elevation (R.O.S.E.) works in the area of community development. They run projects all year round, for people who want to experience life in rural India and the foothills of the Himalayas. The activities involve teaching at a local school, farming, and construction. Volunteers live with a local family and get to learn about culture while enjoying nature. Pyunli is a small NGO in Gauchar, high up in the Chamoli district of mountainous Uttarakhand, on the way to Badrinath. It aims to bring about meaningful changes to society through empowerment of women and education of children. The NGO is named after a very popular flower in the region's culture, which symbolizes a beautiful woman who lived in the forest. Volunteers can teach the local kids various things (such as English, music, drama, yoga) and also participate in organic farming. Sadhana Villiage is a residential care center for intellectually disabled and underprivileged adults. It's located in a village 30 kilometers from Pune (around four hours from Mumbai), and has been taking volunteers since 1995. The organization's focus is on education. Volunteers assist in workshops, cultural activities, and community development projects for women and children. Meals and accommodation are provided, but donations are appreciated as the organization doesn't receive government funding. The Salaam Baalak Trust, conveniently located in Delhi's backpacker Paharganj area, provides shelter, food, and support to the city's homeless street children. Another inspiring initiative is its City Walk program -- tours along the back streets of Delhi led by children who have trained as guides. The diverse opportunities for volunteers include education, creative expression, computing, marketing, and health care. Internships are also offered. The organization has a conveniently located flat for volunteers to live in at a minimal cost. Ladli, meaning "loving girl", is a small organization that provides vocational training for approximately 100 abused, orphaned, and destitute street children. It's located in Jaipur, Rajasthan. Volunteers work in child care, teach English, and lead children's activities. The organization doesn't charge any fees, but volunteers need to pay for their own accommodations and food. There are usually around three or four volunteers from around the world working there at a time. Some are there for a week, others stay for a year. The Mandore Guest House in Jodhpur, Rajasthan is an excellent option for voluntourism. This bright and groovy guesthouse is run by a family who also operate the Marwar Medical & Relief Society -- a non-profit organization that's adopted local villages to help improve their infrastructure and education. Guests can join its volunteer programs for two weeks or more, mainly helping children with their English skills. This opportunity will particularly appeal to those who don't want to step too far out of their comfort zones (such as staying in remote rural areas in Indian-style accommodations) to volunteer. Seva Mandir is located in the white city of Udaipur, in Rajasthan. It's a large and well established organization that's been doing development work in rural Rajasthan for over forty years. Volunteers get to work on projects that match their experience and interests. Activities include assisting with day-to-day operations, conducting research, undertaking independent assignments, and developing training modules. Guest houses/dormitories, fully furnished and with shared kitchens, are provided for volunteers. Volunteers are responsible for all their meals. UK citizen Joe Homan founded this charity in 1965 as a center for destitute boys, just south of Madurai in Tamil Nadu. He quit his teaching job and relocated to India after being shocked by the suffering of children there. The charity has grown considerably over the subsequent years to include seven residential homes for boys in south India, as well as similar projects for girls and younger children. Volunteers will be involved in the running of the residential projects and the children's daily activities. An interview is required to be accepted. Simple guesthouse accommodations are provided at a nominal charge to cover overheads. Terre des hommes CORE (Children’s Organization for Relief and Education) is based in Tiruvannamalai, in Tamil Nadu, and works in six places in the state to improve child welfare and development. The organization currently cares for more than 2,700 children through its various children's homes and projects. It was founded in 1994 by an Indian man, who lost his parents when he was 21, and a German man. Volunteer opportunities are available for people who are interested in protecting and helping children in need. The work can be as simple as sharing a skill with the children. Those who have seen the documentary Born into Brothels will know about the red light districts in Kolkata, and the problem of prostitution and trafficking. The positive thing is that there are many non-profit organizations doing wonderful work to help rehabilitate affected women and children, and also prevent the spread of sexually transmitted diseases. These organizations don't provide board and lodging, but neither do they charge fees for volunteering. Human Wave is a Kolkata based organization that runs community development and health schemes in West Bengal, including volunteer programs in the Sundarbans and youth projects in Kolkata. Volunteer opportunities are available for two weeks to three months. Volunteers pay a small fee for food and accommodations.